In our first episode we discuss the movie Looper, starring Joseph Gordon-Levitt (JGL) and Bruce Willis. 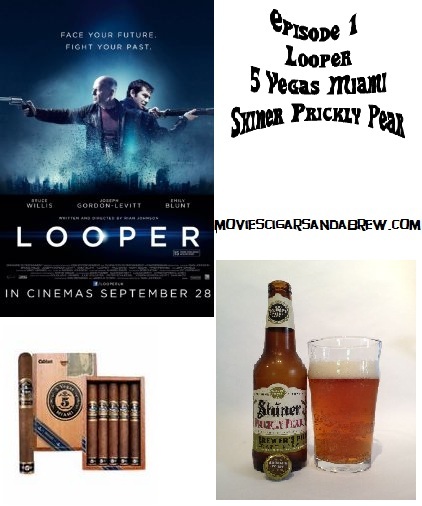 We also sampled a fine #5Vegas Miami cigar and imbibed a #Shiner Prickly Pear beer. Looper is a quasi post apocalyptic movie that stars JGL as Joe Simmons, a hit-man in the year 2044. His task is to kill people that are bounced back in time from 30+ years in the future by organized crime. Apparently in the future tracking is so well done that you can’t kill someone without being found out. Time travel has also been invented and outlawed but has landed in the hands of the MOB. The contract hit-man earns a sum of money on each contract as silver is sent back taped to the back of the hooded victim. A person’s contract ends when they are sent back a future version of themselves, which they kill without knowing, and collect a golden pay day thus, “closing the loop”. This is the basic construct of how the movie is set-up. In episode one we look at the world of Looper and examine whether or not the story holds up to scrutiny. We also express our opinions on a 5 Vegas Miami as well as Shiner’s Prickly Pear.